Noel Meade brought Gordon Elliott's winning streak in the Troytown Chase to an end as Tout Est Permis ran out a comprehensive winner in the feature event at Navan. Elliott fielded 11 of the 25 runners as he went in search of a fifth successive victory in the Ladbrokes-sponsored feature, but he didn't even get one horse in the frame as Tout Est Permis (9/1) outstayed his rivals in style. Ridden by Sean Flanagan, Tout Est Permis moved up to challenge Mr Diablo at the second last as all other contenders began to drop away. Still only a five-year-old, the grey then found plenty on the run to the last, which he jumped safely and galloped four and a half lengths clear. Mr Diablo, a 50/1 shot, kept on for second, with Magic Of Light a further six and a half lengths away in third. He said: "I was very sweet on him, and he worked a bomb the other day. I felt if we just kept him together from then until Sunday, he'd win. Everything went according to plan, apart from nearly getting wiped out over the far side. He travelled and jumped brilliant." Tout Est Permis was previously trained by Mouse Morris and was having just his second start for Meade after last month's victory at Galway. Elsewhere on the card, Jessica Harrington took the training honours with a brilliant 471/1 treble in which Walk To Freedom's game victory in the Proudstown Handicap Hurdle was the centrepiece. The eight-year-old only returned to action earlier this month after an absence of 480 days, finishing 10th behind De Name Escapes Me at Naas. He went toe to toe with that rival again in the closing stage of this extended two-mile-six-furlong event, with De Name Escapes Me sent off the 3/1 joint favourite. Walk To Freedom (20/1) turned that form around in style - swooping after the last for Robbie Power, who drove out his mount for a two-and-a-half-length victory. "All credit to Jessie," said Power. "Because he's been a very difficult horse to keep sound and had so many problems. Fair play to the owners too - their patience has been rewarded, and it's a great pot." Walk To Freedom was completing a double for Power and Harrrington after the earlier success of Jetz (4/1). Grade One-placed as a novice hurdler last term, Jetz had unshipped Power on his chasing bow at this track earlier in November. However, he made no mistakes in the beginners' chase over an extended two miles, coming home half a length in front of Duca De Thaix, with odds-on favourite Paloma Blue well beaten in fourth. Barrington Court (7/2) rounded off Harrington's hat-trick with an impressive success in the Listed bumper for mares. Partnered by Mark O'Hare, Barrington Court flew home in the final furlong to win by 10 lengths from Two Shoe Tom. David Mullins executed a perfect front-running ride aboard Put The Kettle On in two-mile maiden hurdle. 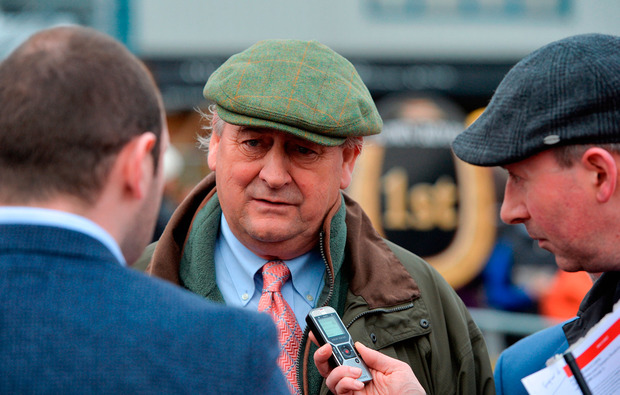 Trained by Henry de Bromhead, the 11/4 chance repelled evens favourite Gypsy Island by a length. The Elliott-trained Defi Bleu got the day off to a good start for Gigginstown in opening maiden hurdle over two and a half miles. He triumphed by two and three-quarter lengths in the hands of Davy Russell, with Gigginstown horses filling the first five places.